He manages a small team of folks who are all pulling toward the same goal. He articulated where he was in relation to the goal and what was needed to get there. And how many more people he’d need. And how long it would take him. His management appears to understand that it’s going to take him some time and while I have no doubt that they’d rather he finish sooner, they’re probably OK with his estimate. But still, he wants to finish earlier and deliver the benefits to his clients and the organization earlier. Much earlier. That’s fair enough — so what can he do? We didn’t get very far before we ran out of time but here’s what I suggested he think about. It’s less a magic formula than it is a thought exercise that I’ve successfully used in situations like his. What’s the other side look like? What does the new “work” look like on the other side of this effort? What will we be doing differently? Are there tasks that we’re doing today that won’t be needed when we’re done? Are there tools or techniques that we’ll be using when we’re done that we don’t have now? This isn’t meant as a positive visualization exercise. 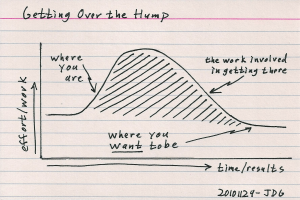 Just think about what your team’s life will be like at the end of the project, on the other side of the hump, when you’re done and things are moving along. The idea is akin to burrowing through the hump rather than going up and over. Figuring out who the real client is can help determine which deliverables have a higher priority. Maybe some of the work can be left on the cutting-room floor. Can the work be changed—the project rearranged—to provide many of the benefits up-front? You might be surprised to find the client quite satisfied with some small subset of the requirements. Perhaps that’s all they really need. I’ll flesh out more of these ideas in future posts. 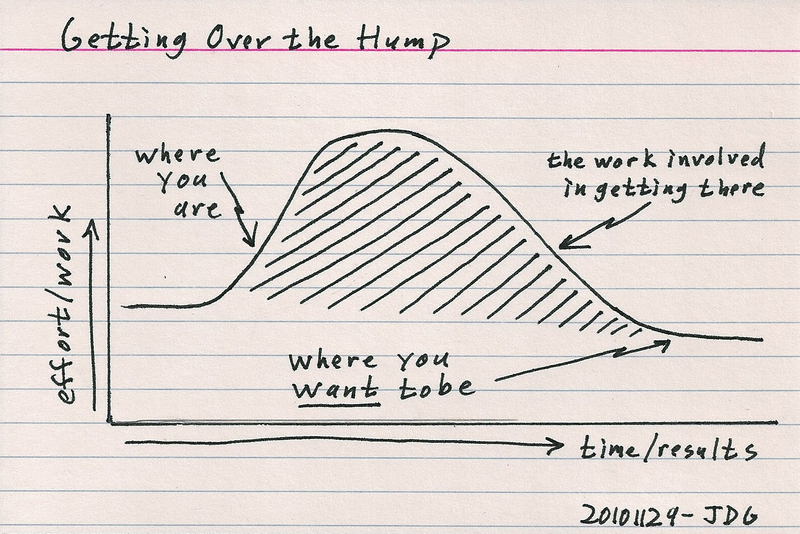 Readers, what’s your hump? What would your work look like on the other side? What will you be doing at the end of your project that could make a significant impact if you were to start doing it today? Comment here or privately to JeffreyGifford (at) gmail (dot) com. * The idea (and this example) that some work cannot be serialized is from Brooks’ The Mythical Man-Month. The idea of using an index card with a hand-drawn graph came from This Is Indexed. This entry was posted in Leadership, Management and tagged management, teams. Bookmark the permalink. A reader emailed me last night about this post. “I think visualizing the end – ‘What’s the other side look like?’ – is especially a good exercise and made me think of The 7 Habits, # 2, ‘Begin With the End in Mind’ of Covey.” Certainly there are some parallels in this point. I agree: “It’s not an easy exercise” and I suspect that a great many of us would benefit from doing it more.